The Society has a peer-reviewed international journal, "Turkish Journal of Hematology", with an International Board. The Journal is the continuation of the "New Istanbul Contribution of Clinical Science" established by Prof. E. Frank in 1951. 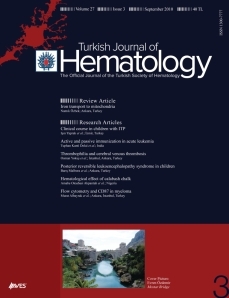 The Turkish Journal of Hematology is the regular publishing organ of the Turkish Society of Hematology. This periodical journal covers subjects on hematology. The journal is an independent, peer-reviewed international periodical, published quarterly (March, June, September and December) in English language. The Turkish Journal of Hematology is a nonprofit scientific peer reviewed journal. The aim of the Turkish Journal Hematology is to publish original research papers of highest scientific and clinical value on hematology. Additionally, educational material, reviews on basic developments, editorial short notes, case reports, original views and letters from specialists on hematology, and hematology medicine covering their experience and comments as well as social subjects are published. TSH publishes bulletins every 4 months for informational purposes of TSH for its members. This journal is in Turkish language and each issue is published on a specific topic in hematology. TSH translated 3 textbooks into Turkish and all are available on TSH website. There are 15 guidelines in Turkish language that are prepared by TSH Scientific Subcommittees on hematological malignancies on TSH website.